A heist gone wrong brings an unlikely group of thieves together and sets of a search for forgotten treasures hidden in the City of the Black Toga! Can our heroes of questionable moral character survive the twisting chase that leads through the Plaza of Dark Delights, crosses paths with Sheelba of the Eyeless Face, and delves into one of the oddest tenements in Lankhmar? Not if the Thieves Guild has their way! 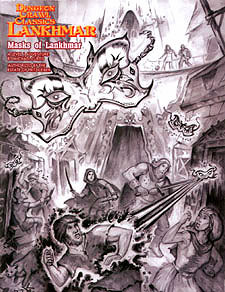 Masks of Lankhmar is the inaugural adventure written for Goodman Games new DCC Lankhmar line of supplements produced with the approval of the Estate of Fritz Leiber. This 1st level adventure is specially designed to start a DCC Lankhmar game set in the City of Sevenscore Thousand Smokes and provides the judge with the perfect means to assemble the players and kick of the campaign. That is, assuming they survive, of course! Look for more DCC Lankhmar supplemental material coming soon from Goodman Games.